William Gee has so far released only dukematch levels here. First 'Labrenth' was an ok dukematch level with medieval theme. 'Labrenth2' has some amazing details and colored lighting. 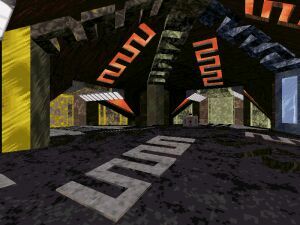 'Labrenth2' is a normal dukematch level where there's this central area in the middle and some hallways around it. Design is very detailed and colored lighting makes it even better. Central area looks amazing with writings on the floor. Textures are great. Gameplay isn't the best but it's ok. It's just so damn hard to hit anything with RPG. To play this against bots use DukeRoch (which you already should have).